The elegant luxury bedrooms found in this gallery showcase custom interior designs and decorating ideas from top designers. 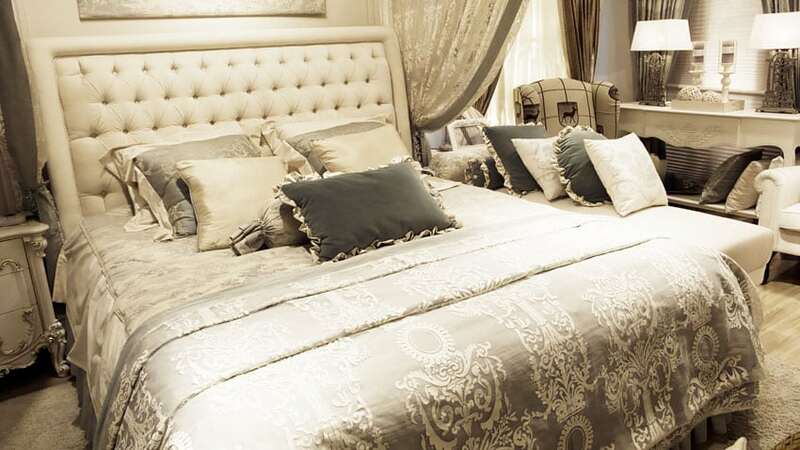 A luxury bedroom should not only exude elegance, but create an inviting ambiance. Take a look at these pictures to get inspiration and ideas for creating your own perfect luxury bedroom. In the picture above, the luxury Mediterranean style of this bedroom can be seen in its rustic use of wide plank oak wood flooring, exposed wood beams, and its choice of solid wood accent furniture. The glass chandelier also add a nice touch to the bedroom. The curtained back wall uses tall, narrow windows to maximize sunlight and give some visual emphasis to the arid desert landscape outside. The use of barn sliding doors is a stylish choice and matches the rustic feel and dark brown color choice of the room. Soothing color palette – Color can really impact the mood one gets when entering a space. Soft neutral colors are generally preferred which allows you to change accessories such as lamps, pillows, lines etc to get just the right look. Bed frame – High end bed frames come in many styles and can be a focal pint of the room. Bed frames with an upholstered headboard are popular. These look contemporary and allow one to relax comfortably in bed with a book. Mattress – A high quality mattress could be considered one of the most important elements of a bedroom. The options when selecting a mattress are almost unlimited and choosing one often comes down to personal preference. Bedding – Beautiful bed linens, pillows and comforters can enhance the overall look of the room and help you keep your decorating consistent throughout the space. Lighting – Elegant chandeliers, wall sconces and night stand lamps are an important part of creating the right mood in a luxury bedroom. Soft lighting is essential to create a relaxing atmosphere. Window treatments – Window shades and curtains can really enhance the beauty and overall aesthetic of the bedroom. In addition they can be carefully selected to match your overall design theme and be paired with the rest of the bedding and decor in the room to get the exact style you desire. The elegance of this decorated luxury bedroom is brought out by the cream white colors of the delicate panel walls, crown molding, and tray ceiling. The carpet flooring uses patterns and colors that match the look of the rustic wood side table, satin blanketed king bed, and white and gold tufted chaise lounge. The lighting fixtures used – the chandelier for the main sleeping area and the lantern pendant light used for the corner reading nook – are classically stylish. The beautiful flower gardens outside the bedroom can be seen through the wide windows on the back walls. This hill-side residence has a bedroom that gives us amazing cityscape views by utilizing large glass windows and a private balcony that overlooks the sights. The contemporary styling of the room interiors really brings out a modern ambiance. It uses a unique globe glass chandelier, a stylish gas fireplace, a geometric-patterned area rug, and white leather lounge chairs and ottomans. Quaint and sophisticated, this bedroom uses cream colors on its patterned wallpapers, Victorian style porcelain lamps, and camel back white tufted headboard, to exude a comforting and relaxing ambiance. The gilded side tables, dark frames of the wall-hung pictures, and the ornamental throw cushions are nice touches of furnishings. The shear white curtains on this four corner bed and the fully-draped back wall makes this luxury bedroom feel intimate and sensual. The warm white glow of the side table lamps also enhance this immensely. Additionally, the intricate designs of the carved gilded camelback headboard, bed side trims, and the side tables keep the room feeling sophisticated. Modern tropical aesthetics give a cozy and warm feel to any bedroom. 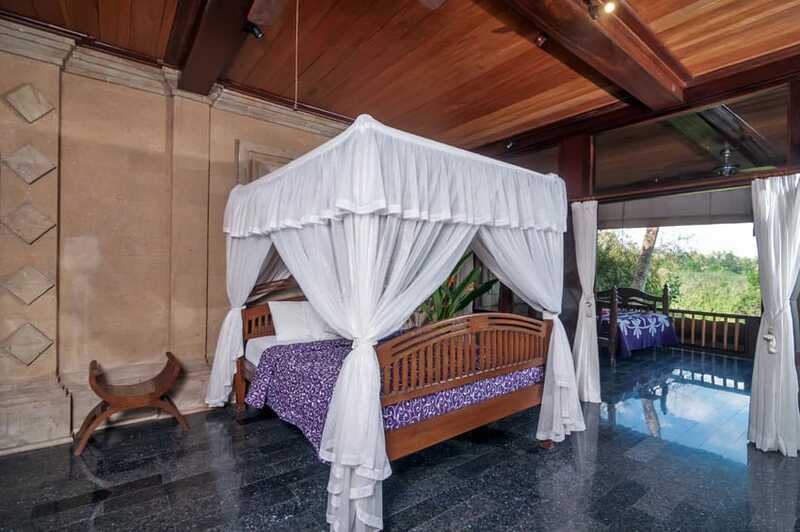 The four-post bed and draping white curtains are for personal intimacy and privacy. The bamboo sidings of the exposed ceiling match the tropical theme. So do the wooden flooring and side tables. When designing bedrooms for romance, shear curtains on four-post beds can almost be considered standard. It creates an unparalleled sensuality and intimacy not many other design elements can achieve. In this bedroom, it also uses rustic clay walls and earthen tones and materials to really make users feel cozy and give them their privacy. Intricately carved wood trimmings and accents are indicative of high-end luxury interior design. This, coupled with equally sophisticated tufted upholstery, can be seen on the wood-framed and white satin camelback headboard as well as the tan-colored bed-end ottoman. The polished metal side table lamp and the select floral wallpaper wall treatment add to the style. The use of solid wood mahogany floor planks give warmth and intimacy. This custom designer bedroom employs bright pop primary colors to really define this space. The cool blues of the contemporary area rugs, the warmth and aesthetic spiciness of the tufted velvet ottoman and headboards and polished brown mahogany floor, and the soft mellow yellows of the accent wall trimmings and decorative throw cushions – such a varied yet cohesive use of color really makes this one-of-a-kind. 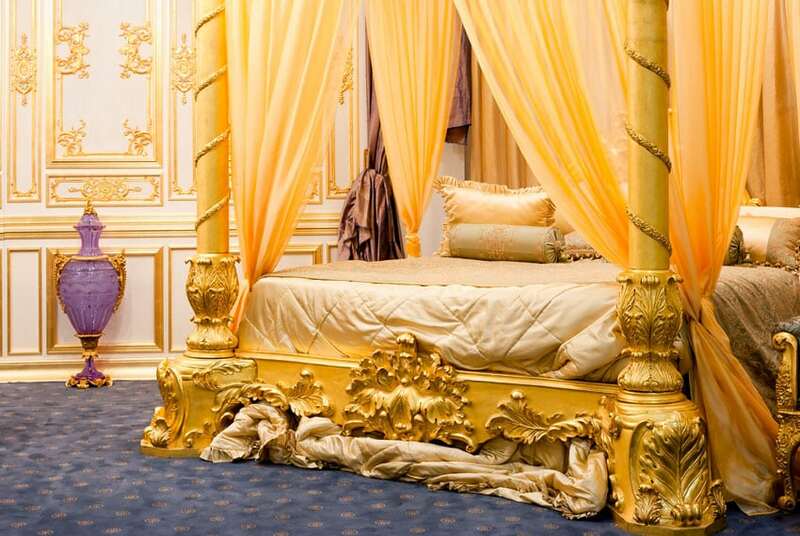 Gilded gold wood carvings can be seen all around this luxury bedroom design. On the white walls, gold accents and trims adorn the panels and the wainscot. On the bed frame, tufts of Corinthian leaves adorn the sides, corners, and even the posts of the king-sized four-poster. The satin sheets, frilled satin throw pillows, and gold sheer curtains for the bed really makes it look high-end and luxurious. The blue carpeting and purple ornamental vase serve to offset the brightness of the yellow furnishings. Blues and yellows dominate this space. The color combination can be seen on the accent walls, bed sheets, and decorative pillows. 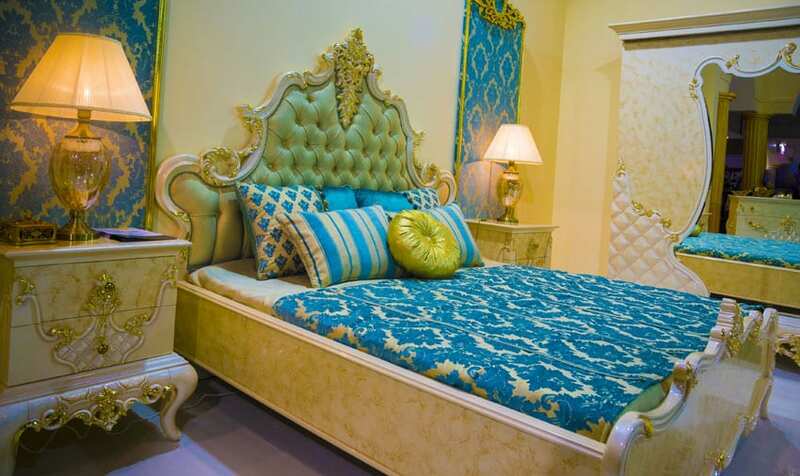 The style of the furniture are also visually striking; the carved ivory legs of the bedside tables, queen size bed frame, and wall mirror frame are all classically stylish and sophisticated. The creative use of wood gives many luxury bedrooms an elegant and sophisticated feel. The varied tones of the wood parquet flooring in this design really brings warmth and aesthetic texture to space. 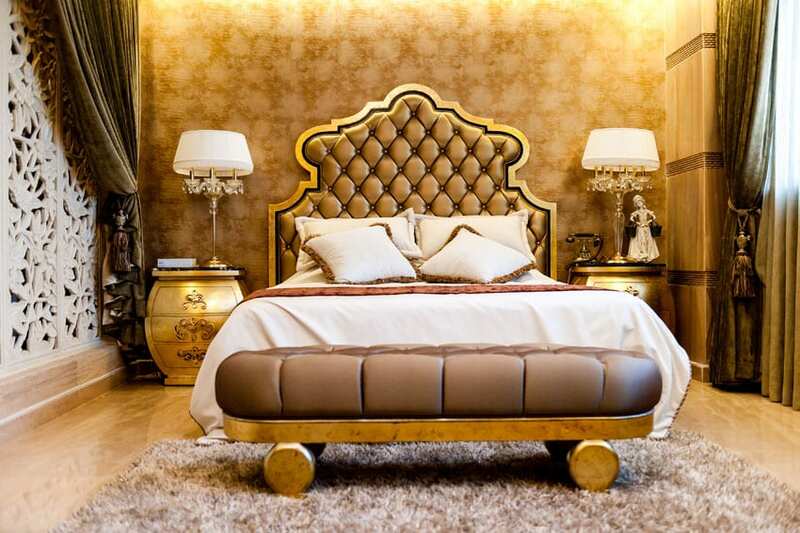 The gilded carved wood of the bed frame, side tables, and drawers are a classy touch and contrast well with the white lampshades and satin bed sheets. To even out the brown and beige of the space, blue-colored walls were used. Gold-colored themes are always a classic design choice when it comes to luxury interior design. The patterned wallpapers, tufted plush headboard, and unique bedside tables are high-end design choices. The shag carpet and matching ottoman are also nice touches. Even the polished mahogany flooring exudes a warm golden feel that matches the ambiance of the room. Clean white bedrooms are visually spacious, light, and bright. The contemporary design choices, such as the modern crystal chandelier hung on the tray ceiling, the retro flower wall reliefs, and the nice pop of color from the purple window curtain, make the room feel personal and full of life. 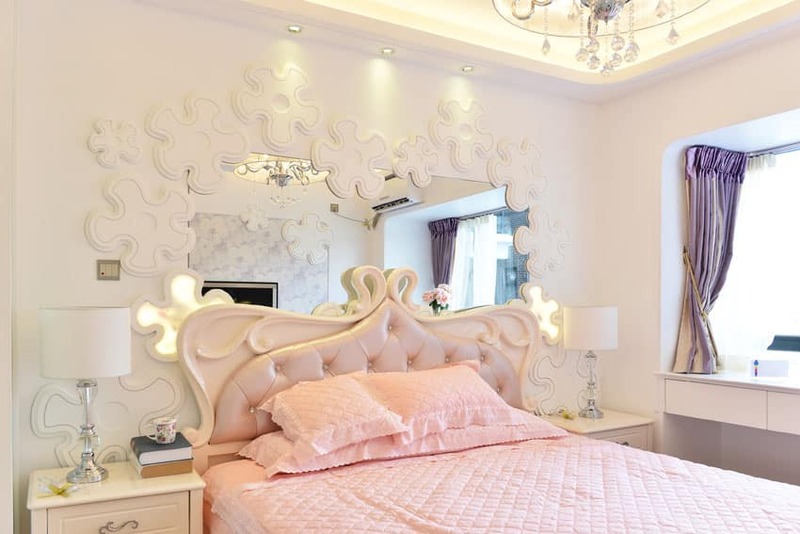 The white bed frame perfectly frames the soft pink of the bedding and makes it look inviting and stylish. The blue satin fabric of the headboard really stands out in this particular design. It’s a perfect contrast to the white elegance of the queen-sized bed, with its throw pillows and matching bed sheets. The beige walls are matched well by the used brown curtains, contemporary bedside drawers, and the window-side lounge chair. 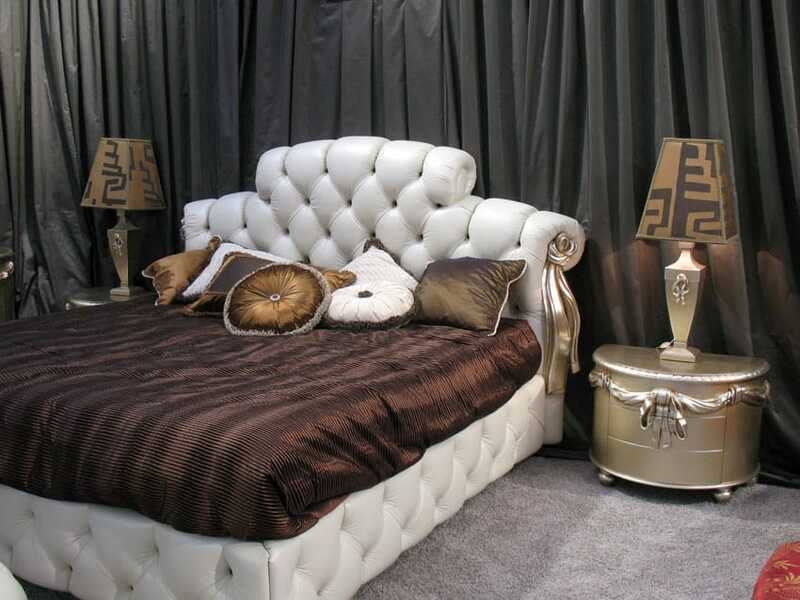 This unique example of a bed frame uses white tufted leather not just on its headboard but on all parts of the bed frame. Dark ray curtains were used to cover all the walls of this space, helping it feel personal and cozy, but still elegant. The gray carpeted floor, carved golden bed-side tables, and modern table lamps, really bring the space together. This bedroom design uses bold use of minimalism and block colors to achieve a look that is clean and contemporary. The gray tufted headboard, with a matching tufted ottoman at the foot of the bed, complements the magentas and lime greens of the bedding and bed pillows. To the side of the window, we see intricate geometric patterns on the bedside lamp and the curtains for the window. Cream whites and light grays make this room feel welcoming and relaxing. With the rectangular leather tufted headboard, the interesting patterns on the bed sheets, coupled with the frilled throw pillows on the bed and on the side ottoman, this bed room design really feels clean and stylish. The used carpet flooring and the window curtains, both also gray, are both nice uses for fabric and are subtle contributors to the room’s overall feel. 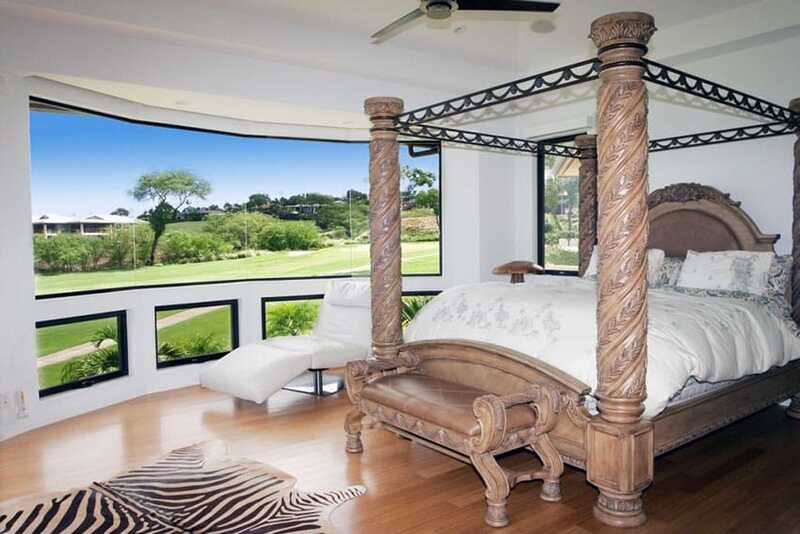 The exotic furnishings of this custom-designed bedroom are nothing short of striking and bold. 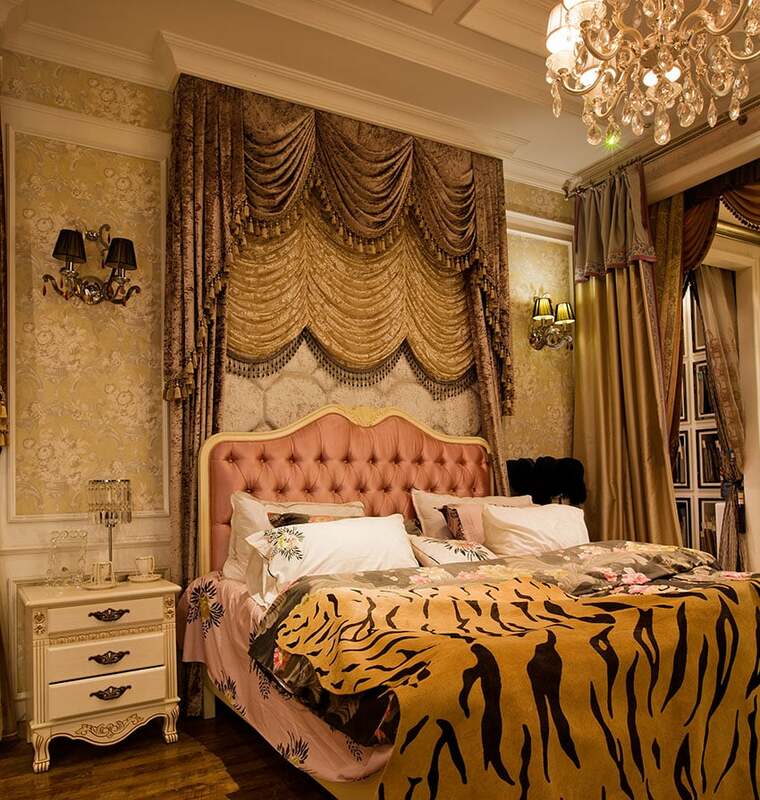 The tiger pelt pattern on the bedding, the draping decorative curtains on the accent wall behind the rose-colored tufted leather camelback headboard, and the sophisticated crystal chandelier really show class and luxury. The treatment on the surfaces are well-designed as well: polished wood floor boards and elegant golden wallpaper. This open-air, exotic layout is unique such that it blurs the line between interior and exterior design. The benefits to this type of bedroom design are numerous: fresh air, amazing views, cool night breezes, and an undeniable spaciousness that can’t be achieved by normal bedrooms. The matching exotic finishes – the wooden bed frame, exposed wooden ceilings, and polished porcelain floor tiles – are all nice touches. The use of a four poster bed and matching white drapes give an additional touch of privacy and intimacy to the sleeping area. Intentional use of a lower ceiling creates more intimate, cozy spaces. This intimacy is carried out even further by the warm, brown tones of the carpet flooring, painted walls, draping window curtains, and use of enticingly comfortable furniture. The chaise lounge and the bed have matching throw pillows and upholstery colors. The subtle use of a glass chandelier also gives this place a splash of personality. Frilled fabrics are seen all over this quaint example of bedroom design. On the throw pillows, on the bed comforter, and even the accent wall’s drapery has a lacy quality to them. The carved headboard matches the sculpted designs of the side lamps and the carvings on the side drawers. To top it all, light, bright whites were used alongside soft browns and yellows to keep this room feeling open and comfortable. This large, decorated bedroom makes smart use of subtle design elements to keep it feeling edgy and elegant. 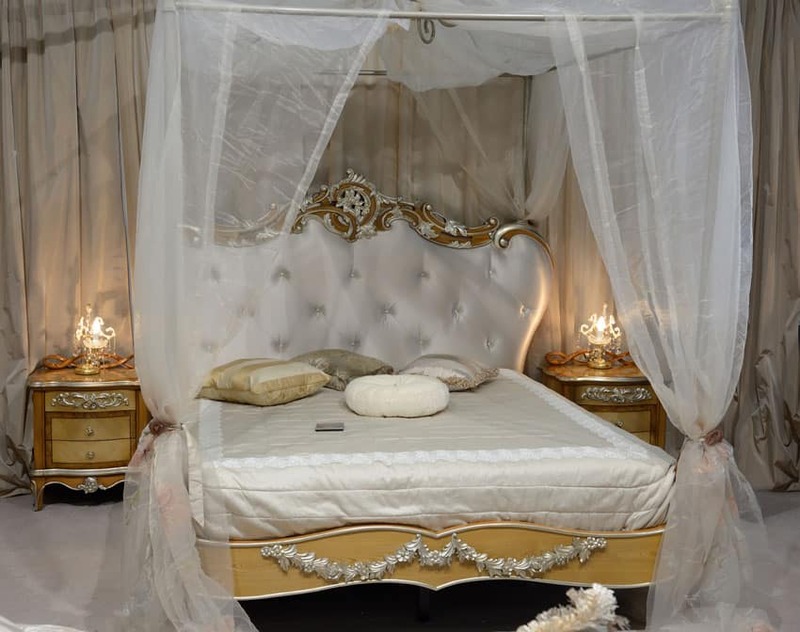 The four-posted bed frame, the contemporary and classic look of the hanging chandelier, and the use of wide, white french doors and draping curtains are all stylish design choices. The red mahogany floor boards and the lavender walls give nice splashes of color to the space. The mostly white color palette – seen on the tray ceiling, painted walls, and numerous french doors and windows – are pleasantly complemented by the warm, earthy tones of the heavily-grained oak wood floors. The fireplace and the ambient lighting of the side table lamps add even more coziness to the space. With the bright light invited in by the glass doors and windows as well as the contemporary look of the central pendant light, this bedroom comes off as pristine, pure, and pretty. 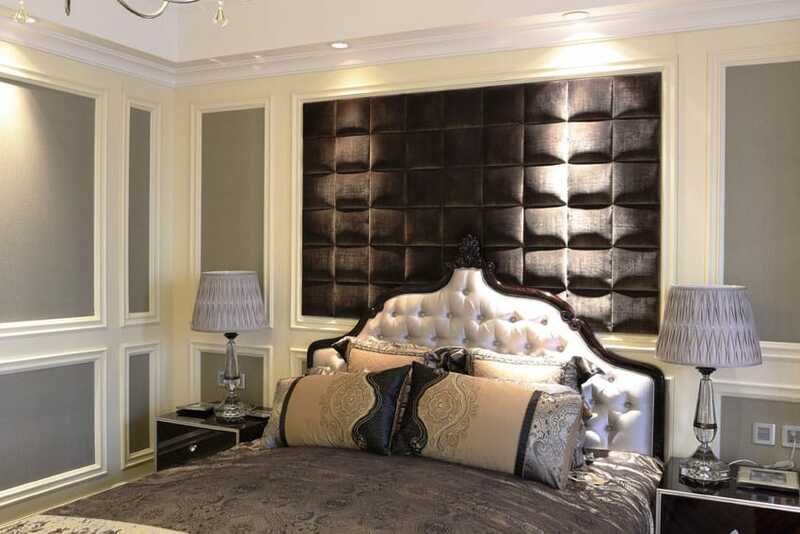 The artful use of a padded patterned black accent wall is a smart design choice for this bedroom design. It is a clear focal point, contrasting the white moldings of the wall panels and exceeding the dark tones of the gray wall areas. The choices of tufted white bed frame, dark satin bedding, contemporary glass table lamps, and minimalist side tables, all come together in this stylish piece of interior design. The designer furnishings, individually, are amazing pieces of designs by themselves. The carefully gilded brass chandelier, the geometrically patterned ottoman, the circular wall mirror, and the different pieces of drawer tables used. You put them all together, however, and they form one cohesive space. The generous use of windows also bring a lot of light into the room, further enhancing the style. Marble fireplaces create a luxury feel within a space almost without fail, and this bedroom design no exception. The matching dark wood teak floorboards also add an extra rich warmth to the area. The heavily-patterned area carpet, the extravagant drapery used for the french windows, the stylish tray ceiling, and the eclectic use of both modern and rustic furniture make this bedroom a perfect example of a balance between cozy and classy. 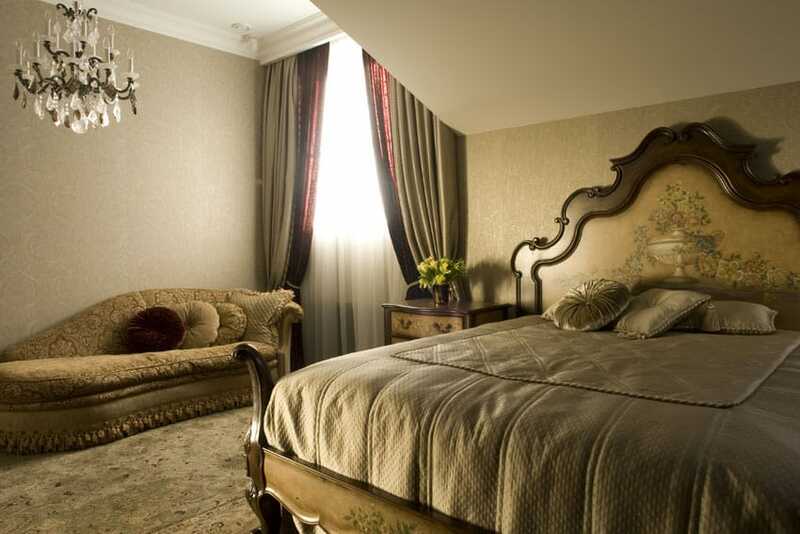 Luxury bedrooms are not solely used as sleeping quarters. As such, integrated sitting rooms are commonly employed to create a nook for quiet contemplation. The nook, in this example, is framed by two white classical columns and its own set of french windows. The rest of the room uses light tan colors to brighten up the space. Carpeted flooring, simple yet bold furniture, and generous use of drapes are also seen in this nice piece of bedroom design. 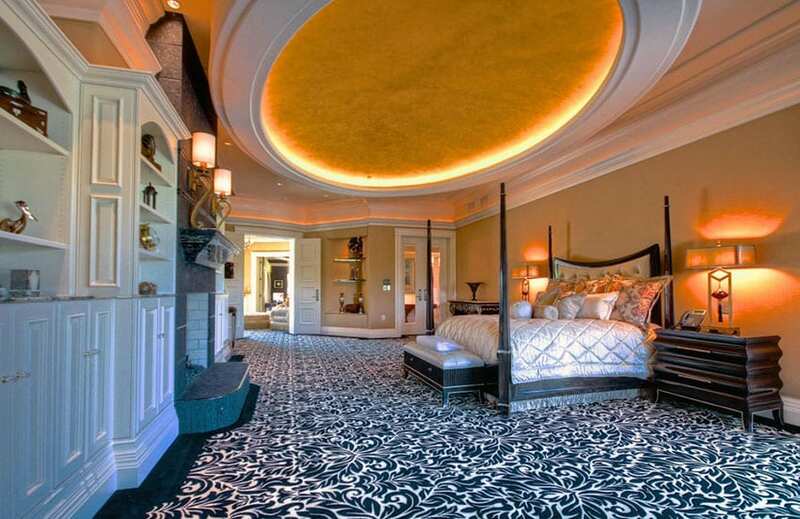 Striking gold patterns on black backgrounds was a smart move for this bedroom space. It creates a unique, bold, yet unquestionably stylish motif for the room. This can be seen on the wallpaper as well as the bed sheets and cushions. 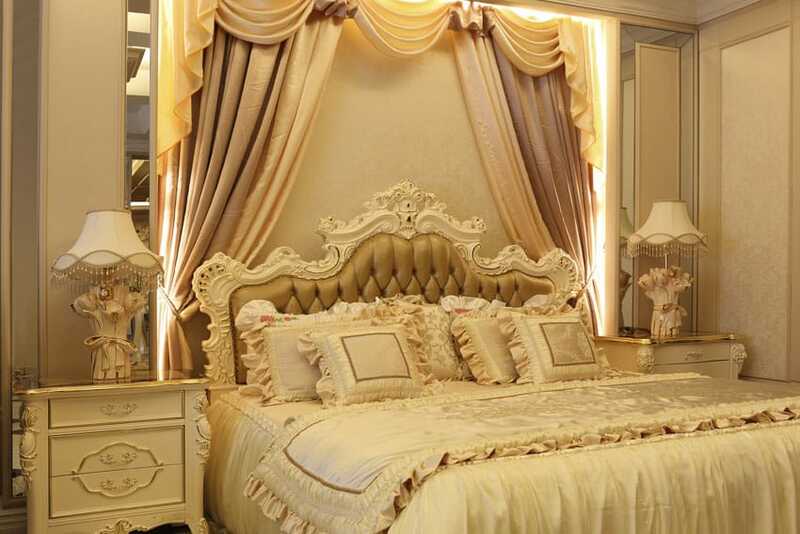 This gold highlight is also reflected on the trimmings of the equally exquisite carved white tufted headboard, accent dresser, and bedside tables. The whites of these furnishings are also good complements to the black and gold. Flowing and draping curtains create an almost ephemeral elegance to this bedroom. They are used as clever framing for the reading nook and side windows as well as the accent wall behind the brass headboard. The use of bright, vibrant yellows also add warmth and life to the space. The side ottoman, queen-size bed, and the linens and throw pillows used all match with the feel of the bedroom. The glass chandelier is an additionally fine final touch. Picturesque landscape view windows are perfect for bedrooms that overlook lush greenery such as this. The lovingly hand-carved details of the four-poster bed and ottoman legs are made out of warm mahogany wood that are left polished yet beautifully raw. The floor boards are similarly cozy and enhanced by the zebra skin rug. The use of clean whites for the lounge chair and the bed linens is a smart choice that goes well with the white painted walls and ceiling. Blue is the color of the hour for all hours in this interesting piece. The microfiber upholstery of the chaise lounge and ottoman, the tray ceilings and painted walls, the window curtains, and even the bed sheets and throw pillow – all are a different shade of blue. The metallic framing of the four poster bed as well as the brass chandelier offset the blue a bit. The colors of the crown molding and the window frames also add a nice splash of pristine white to the room. This cozy bedroom almost screams personalized, intimate ambiance. The floor area is reasonably minimal but still very much usable. And the small space available was maximized with the use of very little furniture. The furniture that was used – the contemporary white drawer, the simple circular bedside tables, and the queen-sized bed – was appropriately stylish and personal. The use of shear curtains for the windows adds much needed light and visual spaciousness to the area. This glamorous luxury bedroom uses artful splashes of color and pattern to really define the room. Even the eccentric use of the industrial twin ceiling fan gives this space a certain charm. The artistic portrait hung on the back wall, the use of an ornate red and blue floor rug, and the eccentric patterns on the arm chairs of the reading nook are all smart design choices. 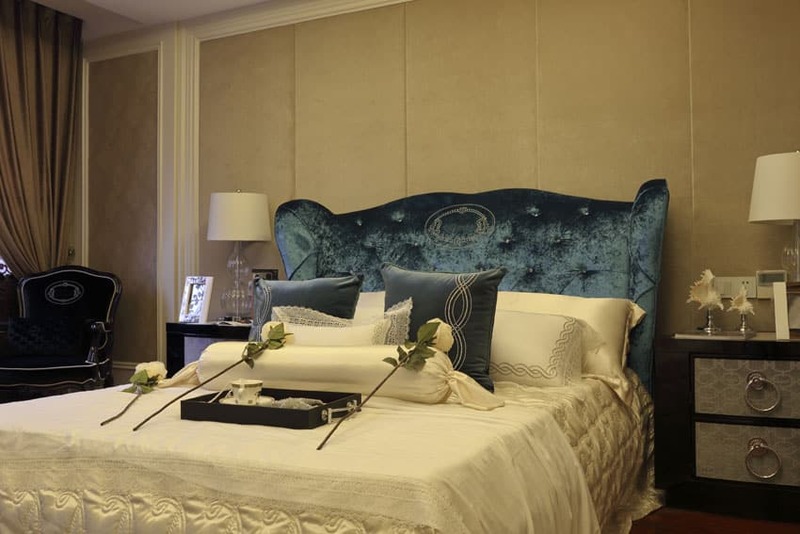 The main bed area uses an elegant tufted leather headboard with fine carved details adorning its dark wood framing, a bright blue bedding that really makes the bed stand out as an accent piece, and quaint side tables with classically beautiful table lamps. In large and upscale homes, floor space is seldom a problem. Instead of filling up the space of the bedroom with furniture, this design proves that less is more. The minimal use of furnishings really bring out the elegance of the four-posted bed with white satin sheets and tufted white headboard. The matching accordion-like side tables are also nice design choices. To keep the area looking visually busy and pleasing, a nice white and blue pattern was put on the floor carpeting, and the ceiling employs a nice recessed lighting scheme on an oval-shaped tray ceiling. The various white shelving and cabinetry also goes really well with the marble fireplace that brings the whole place together. This spacious open layout takes advantage of not just its wideness but also its height. Not only do we see classical Victorian pieces of furniture – the leather ottoman, the carved wooden-legged arm chairs, the elegant side tables and decors, and the classy carved wood poster bed frame – but we also see amazing design choices for the tall walls and the ceiling. Ivory paneled walls, tall windows with circular clerestories on top, and a beautiful glass chandelier that hangs from an amazing tray ceiling all make this space feel luxurious and elegant. Gold and red is a color combination that lets out an ambiance of pride, majesty, and style. The amazingly ornate carvings on the ceiling moldings only show the level of detail applied to this room. 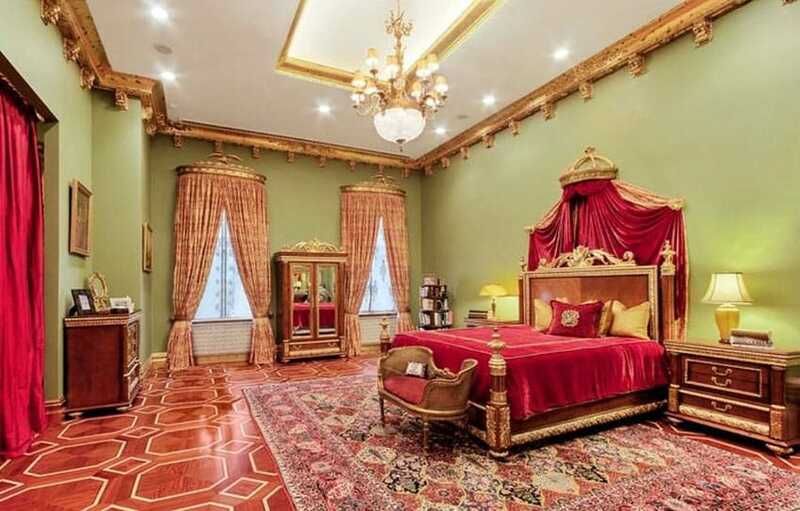 The gold and red curtain drapes, bed frame and bed sheets, as well as the floor tiles are all intelligent design choices and carry the motif well. The beautiful dresser, drawer, and side tables are also a nice touch. Luxury bedrooms connected to outdoor patios create a juxtaposition of spaces that are smart and functional. To add to that, the use of a large view window and view door brings more of the outside space into the room. Nevertheless, privacy is still important, and so that’s where the Venetian blinds and draping curtains come into play. 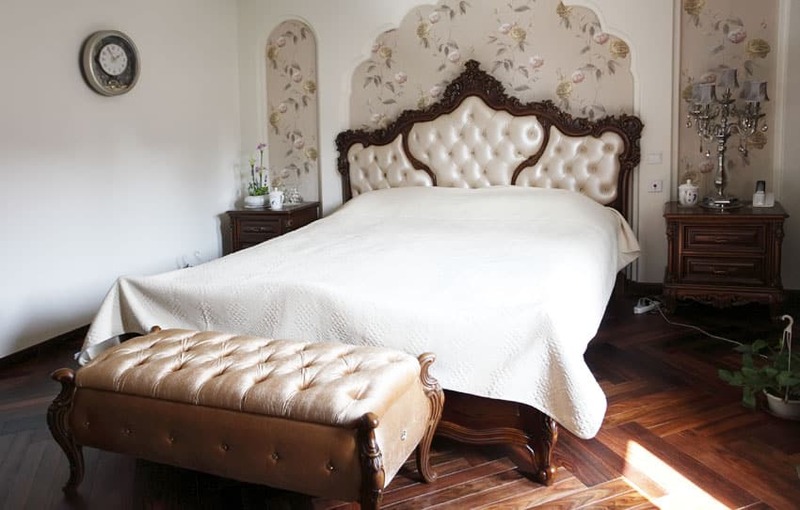 The tufted chaise lounge, the warm wood tones of the floorboards, and the elegant style of the bed frame all contribute to the beauty of the room. The multi-level tray ceiling and motorized ceiling fan are also nice final touches to the design. 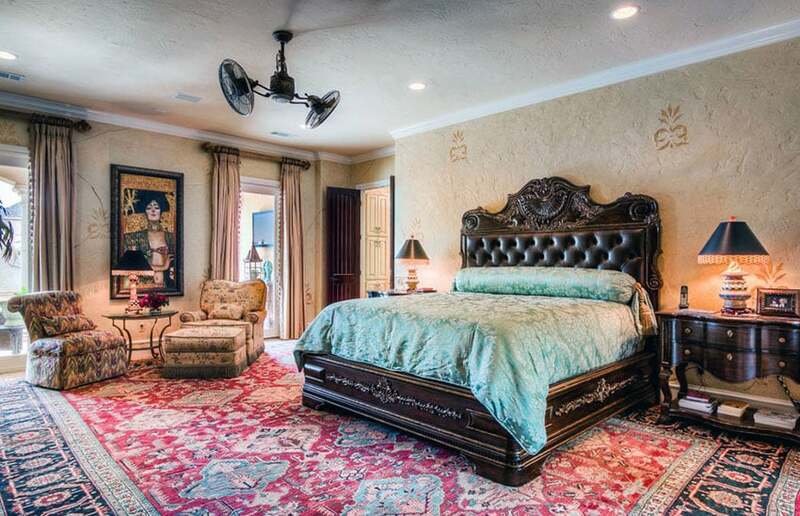 This palace-style luxury bedroom uses intricate archways, subtle ornate wall carvings, an amazing brass chandelier, and generous use of hung portraits and pictures to create a high-end and regal feel. The four-posted bed is also an elegant touch and really gives a warm vibe to the room. This stylish bedroom is humble yet striking. The dark warmth of the wood used for the drawers, bedside tables, and bed frame really go well with the light beige of the walls, drapes, and bed sheets. The minimalist styling of the drawers and headboards, not to mention the ottoman and tray ceiling, are also quietly sophisticated and elegant. A more traditional approach of using opposing dark and bright colors to really make this bed room pop. The dark wood of the four-poster bed frame, the wardrobe, and the chaise lounge go well with the light blue of the walls, the whites of the tray ceilings, and the tans of the area rug and bed sheets. The classic use of the crystal chandelier, tray ceiling, and carvings on the bed frame and furniture is also much appreciated. The Mediterranean style of this bedroom is really brought out by the smart lighting design found all around the room. From ambient tones created by the wall lamps and recessed lighting to the more prominent rays cast by the table lamps and elegantly-designed pendant light, this room is quite stylishly illuminated. The other design elements such as the oak wood floors, sophisticated leather lounge sofa, carved bed frame and side tables, and especially the stone fireplace, all make this a wonderful piece of architecture and design. 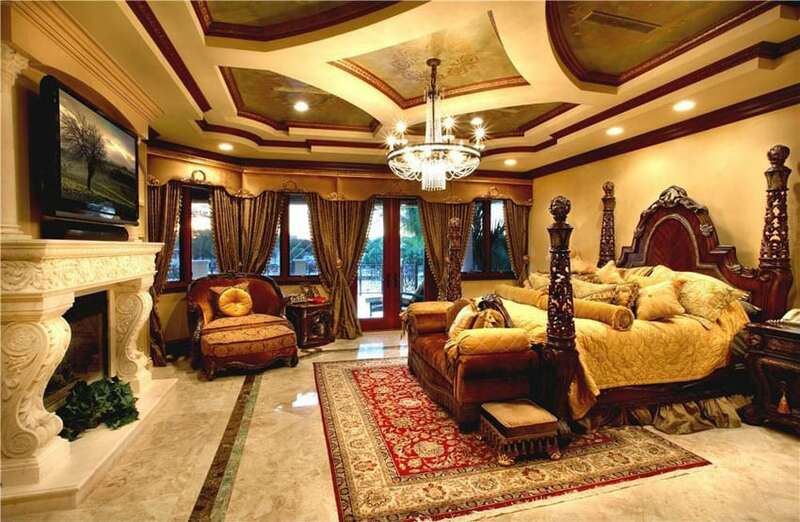 This bedroom is nothing short of majestic. They took a page out of the Sistine Chapel design book and applied beautiful murals on the ceilings. 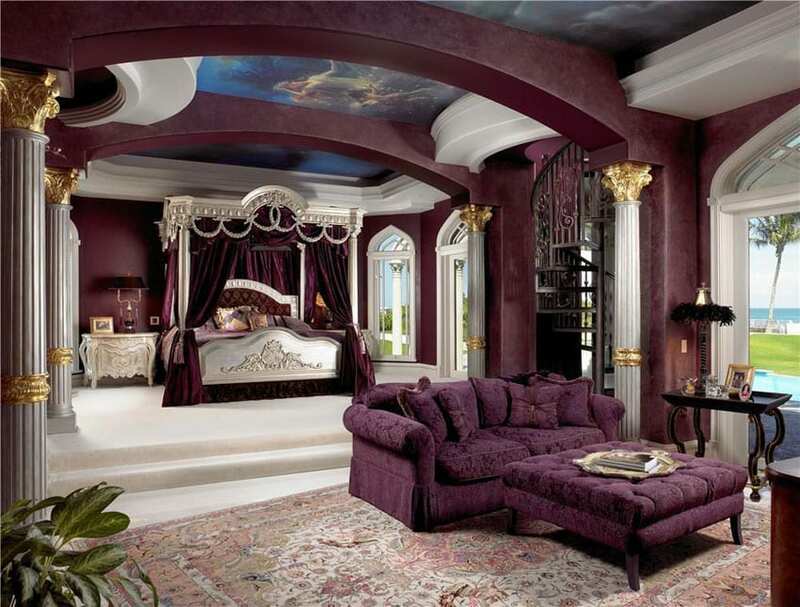 Elegant maroon archways serve to segregate the sitting area and sleeping area. The maroon motif is seen the drapes of the white four post bed, the English sofa, and the ottoman. The pillars around the room have gilded Corinthian capitals and add extra sophistication to the space. The marble floor also add a nice finishing touch. 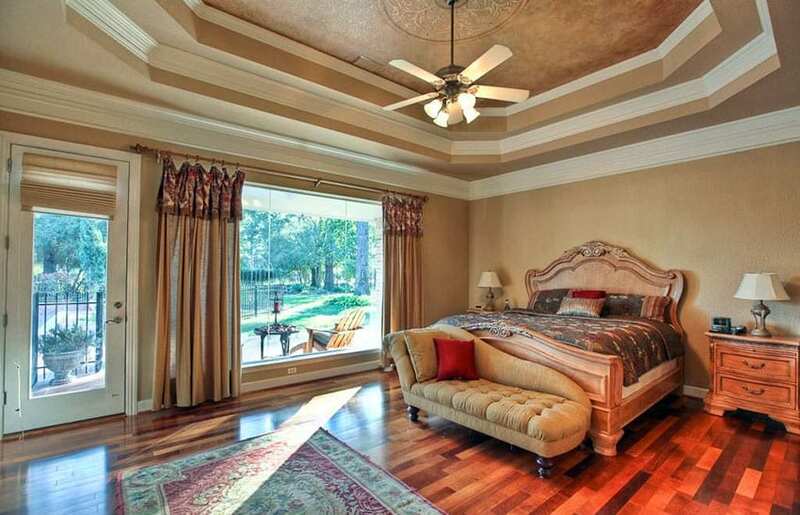 The dark, intricately-carved tray ceiling goes well with the Carmel oak wood flooring in this sea-side bedroom design. 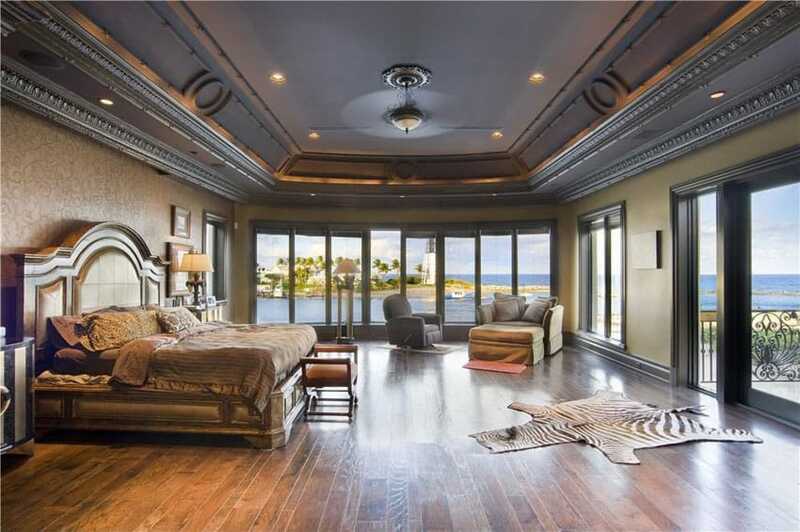 The expansive ocean views can be seen through the full-length windows and doors. The use of contemporary and classic furniture elements also add style. The zebra pelt area rug, the mid-century modern lounge chairs, and the classic queen-sized bed are all beautiful pieces. Azures and beige colors adorn the design of this bedroom, with the picturesque views of the lake helping out with the blue in the room. The draperies, the bedding and cushions, and even the flooring help carry out that running color motif. The use of a glass fireplace, chrome metal chandelier, circular clerestory window, and carpeted floor really make this place feel unique and luxurious. This beautiful, blue bedroom uses ocean blue bedding, a tufted and upholstered azure headboard, an elegantly blue painted tray ceiling, and blue draperies to really drive its point home. To even out the use of blue, browns and beige were used on the travertine flooring, dark wood door, and the different moldings and trimmings around the room. 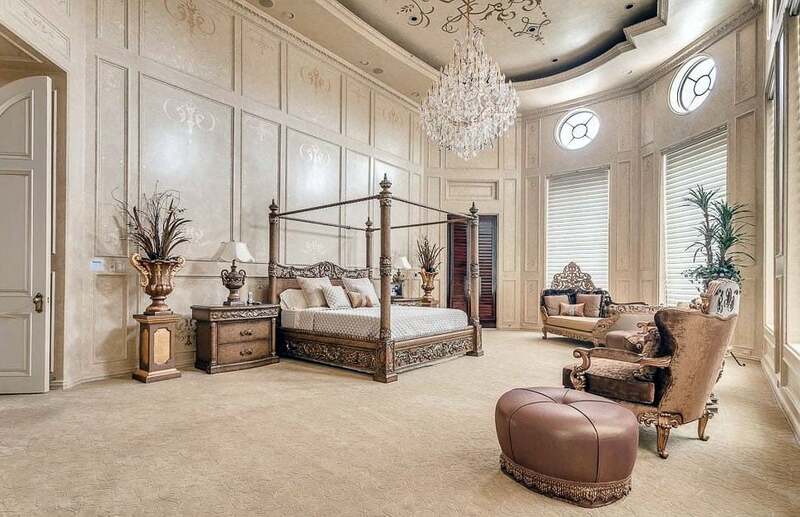 The polished white marble floor, the carved stone fireplace, the intricate partitioned ceiling, and the ornate styled bed posts – nothing about this bedroom can be said to be anything less than beautiful. The luxury of this space is carried out even more by the hanging crystal chandelier, the microfiber chaise lounge and armchair, and the draping curtains of the windows and view door. The cozy charm of this space comes from the choice of different design elements. The simple rustic chandelier, the elegant french windows, and the use of dark wood vinyl tiles are only some of the reasons this bedroom design works so well. The contemporary furniture pieces – the lounge chair and ottomans – go well with the quaint queen-sized bed and side tables. The use of house plants also give freshness and life to the room. The amazing view of the town and mountains outside the wide window really sets this bedroom apart. The rest of the design elements also give this room style. The helical posts of the four-posted bed and the matching helical columns of the stone fireplace are unique and stylish. 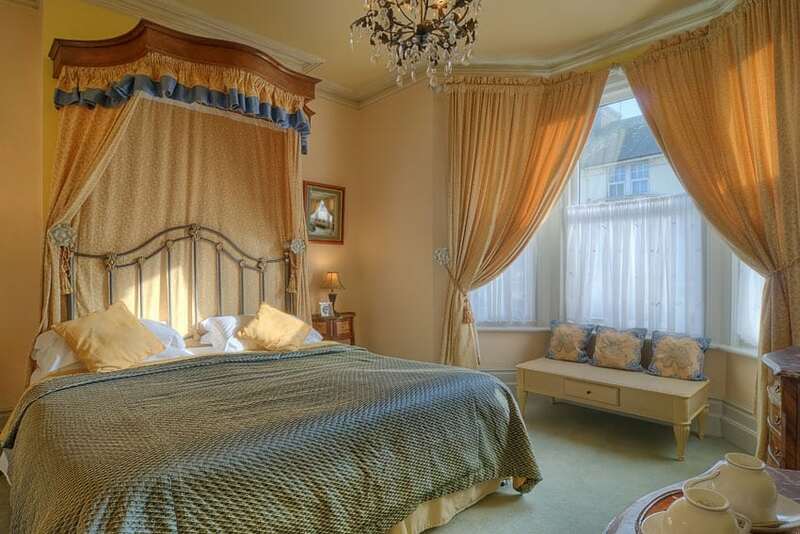 The matching draperies on the bed frame are good as well.The reflective gold of the tray ceiling is a nice contrast to the warm cherry floorboards used. The sitting area has modern cabriole lounge chairs and a pristine pearl area rug that really defines that space. This contemporary design utilizes the ever-stylish black and white contrast motif to keep this bedroom edgy and modern. The black leather arm chairs and ottoman have white geometric patterns that carry out the motif. The black porcelain tile floor is an amazingly beautiful design touch. The white walls, ceiling, and glass chandelier contrast the black floors accordingly. A refreshing touch of light olive is also used on the accent wall and bed linens. For integrated sitting areas in a living room, sometimes spacious floor areas permit the design to really segregate the different activities in the space. In this contemporary design, the sitting area has its own enclosure with matching chrome chandelier and view doors and uses white modern couches, a blue leather ottoman, and chaise lounge. In the sleeping, area, we have the white and blue modern king-sized bed, blue leather ottoman, and entertainment center and shelving. 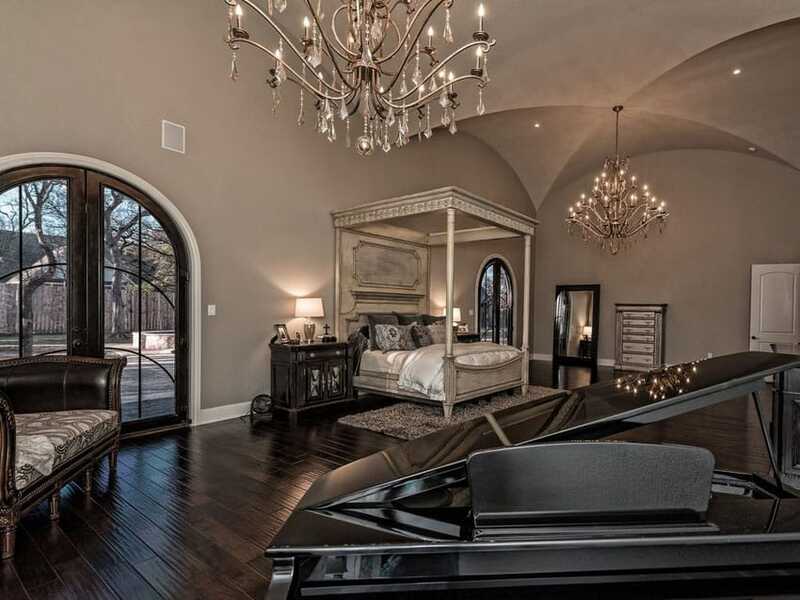 Grand pianos can add design charm not only to living rooms but to luxury bedrooms as well, as seen in this design. The vaulted ceilings, the brass chandeliers, rich mahogany floorboards, and Victorian furniture cements the luxury branding of this room. 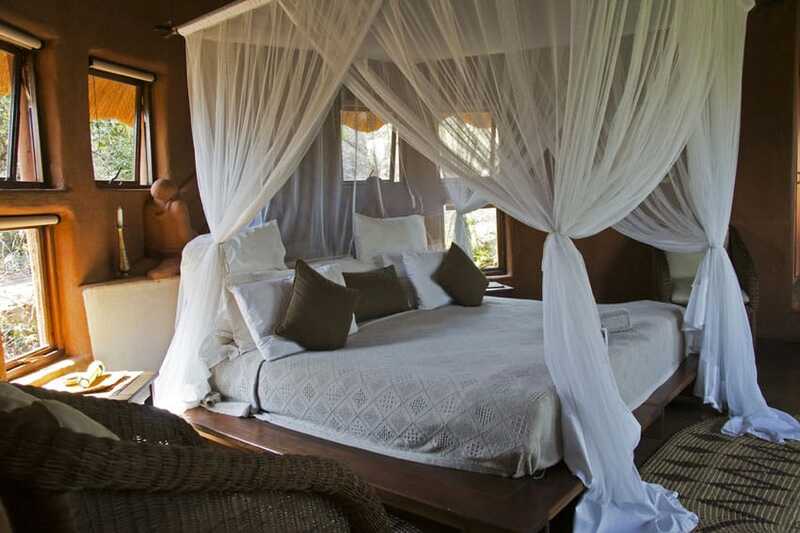 The four poster bed tops it all off with a sleeping area that is both sophisticated but comfortably enticing. 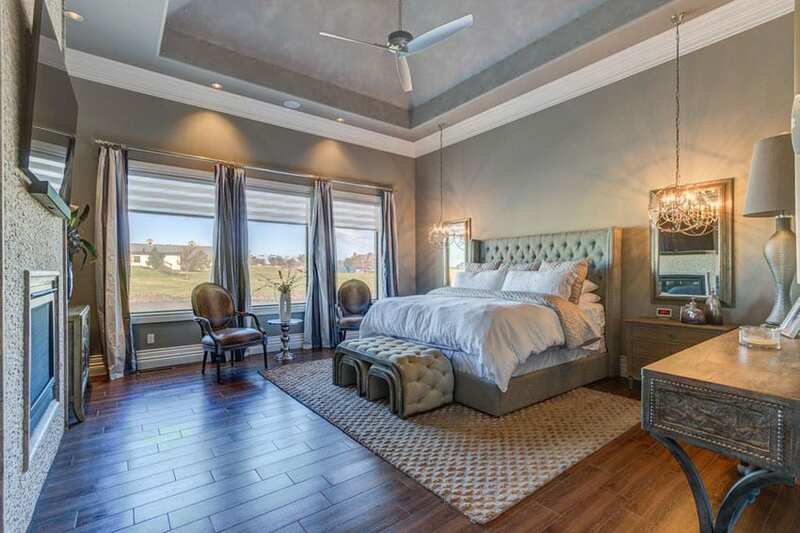 This master bedroom employs a tufted ottoman, a similarly tufted headboard, wood floors, and a gray tray ceiling to create a charming ambiance in the space. Hanging pendant lights are located right above the bedside tables and are reflected by the corresponding wall mirrors. The nice views of the outdoors seen through the tall windows also give some brightness to the areas of the room. The gas fireplace on the front wall keeps the room cozy and intimate.